The anemone plots at Carpinteria consist primarily of the solitary anemone, Anthopleura sola rather than the colonial anemone Anthopleura elegantissima (note that these were considered a single species prior to the past several years and they are not distinguished in our sampling methods). Cover of Anthopleura has hovered around 30% plus or minus 10% since plot inception in 1992. At the same time, other red algae (a lumped group with filamentous red algae as its primary component) have fluctuated wildly from 10 to nearly 80% cover, largely coincident with periods of sand inundation. In recent years, one species of red algae (Chondria nidifica) along with patches of Phyllospadix sp. have been increasing within and around the anemone photoplots, though these trends are not apparent in the figure. The barnacle plots at this site consist of a mixture of Chthamalus dalli/fissus (note that species were not distinguished until 2001) and Balanus glandula with the former dominating some plots and a more even mixture in others. 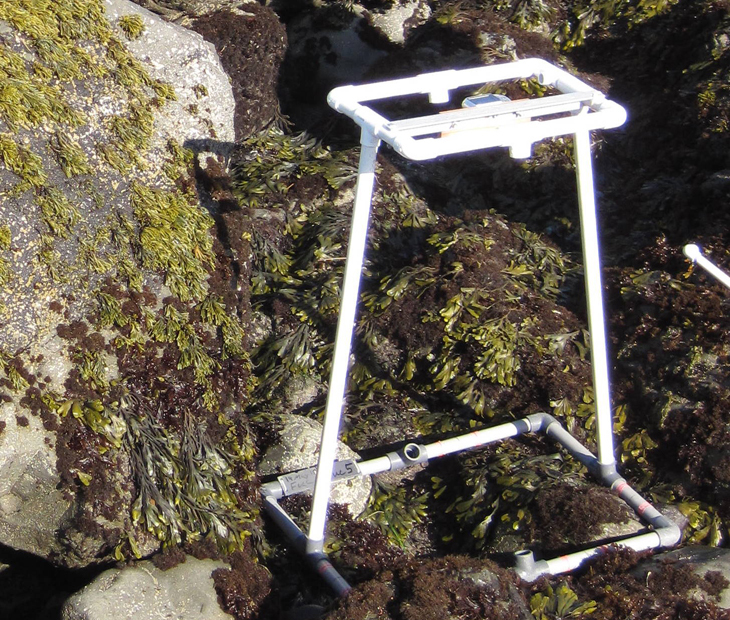 Unlike some other monitoring sites, most of these barnacle plots are located atop rock outcrops and, with one exception, are not subject to periodic sand scour and/or burial. Thus they have not experienced dramatic fluctuations in barnacle cover as a whole, though one plot is subjected to regular scour and is nearly always covered by ephemeral Ulva with little barnacle cover. The plots experienced a strong recruitment pulse in 1994 resulting in a mean barnacle cover around 90%. This was followed by a gradual decline to less than 40% cover through 1998, an increase to 60% by 2004, and a decline to below 20% by 2012. Presently the mean cover is around 30%. Motile invertebrate counts at this site began seasonally in the fall of 2000 and were changed to annual sampling in 2004. Within the barnacle plots, limpets are abundant and have fluctuated between 50 and 200 individuals per plot on average. Littorines are also abundant and have varied widely throughout the years from around 1000 individuals per plot in 2002 to very few in 2007 and in 2012-2013. Presently the numbers of both limpets and littorines are in the range of 50-100 individuals per plot. The Pollicipes plots at this site started out in 1992 with abundant Pollicipes cover (~60%) compared to mussel cover (~10%). Throughout the years, there has been a gradual convergence in the relative cover of these two species with mussels often exceeding Pollicipes in cover. Presently, Mussels are around 40% cover with Pollicipes cover around 30%. Pollicipes has shown seasonal variation (lower in spring, higher in fall) with the inverse pattern reflected in bare rock. Motile invertebrate counts within the Pollicipes plots show the regular occurrence of whelk snails (Nucella spp.) and shore crabs (Pachygrapsus crassipes) in the range of 5-10 individuals per plot on average. Limpets are generally more abundant but have fluctuated wildly from just a few to nearly 100 individuals per plot on average. A decision was made to cease motiles counts in Pollicipes plots in 2014. The Mussel plots at Carpinteria have been highly variable throughout the years ranging from over 90% mean cover of Mytlius to nearly zero. Mussel cover has been more consistent over the past few years hovering around 50%. Periods of mussel decline were caused by extensive mussel bed breakouts that are in turn the result of frequent episodes of pounding surf on the outer reef at this site. Pulses in cover of the ephemeral alga Ulva spp. have occurred in the wake of these mussel breakouts. 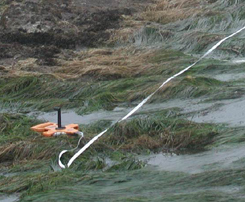 Data gaps are caused by the presence of harbor seals on this portion of the site which, when present, prevent access to the plots. Motile invertebrate sampling shows that chitons (Nuttalina spp.) and snails (Nucella spp. and Tegula funebralis) are regular occupants of these mussel plots, along with littorines, which were more common in the spring of 2004, and limpets, which show two strong abundance peaks in fall of 2003 and fall of 2009. The sampling of littorines within these mussel plots ceased in 2014.. The mean cover of Surfgrass (Phyllospadix spp.) at this site has fluctuated throughout the years from about 10 to 90%, with seasonal variation (lower in spring, higher in fall) and one period of particularly low cover from the fall of 1998 to the spring of 2000. During that latter period, the apparent decline in Phyllospadix was met by a corresponding increase in the kelp Egregia menziesii, while seasonal dips through the years resulted in increases of red algae (primarily filamentous red algae but also including Chondria nidifica and a few other species). Egregia had another pulse of cover in the fall of 2008 but this did not coincide with an apparent Phyllospadix decline. The disparity between these two events is likely the result of changes in sampling methodology: in the early years, samplers would record the topmost species encountered at the sampling point, but after 2000, in situations where fronds of Egregia lay atop a Phyllospadix understory, both species would be recorded for that sampling point. Thus, some portion of the apparent Phyllospadix decline of the late 1990's may be misleading as the increasing Egregia may have been merely covering over a healthy Phyllospadix understory. In recent years, Phyllospadix cover has been fluctuating seasonally between about 60-80%%. Seastar (Pisaster ochraceus) abundance within the original transect swaths has been variable at this site from over 70 stars counted and measured to just a few. Seastar numbers were particularly low from 1994 through 1999 followed by a period of higher numbers from 2002 to 2006. 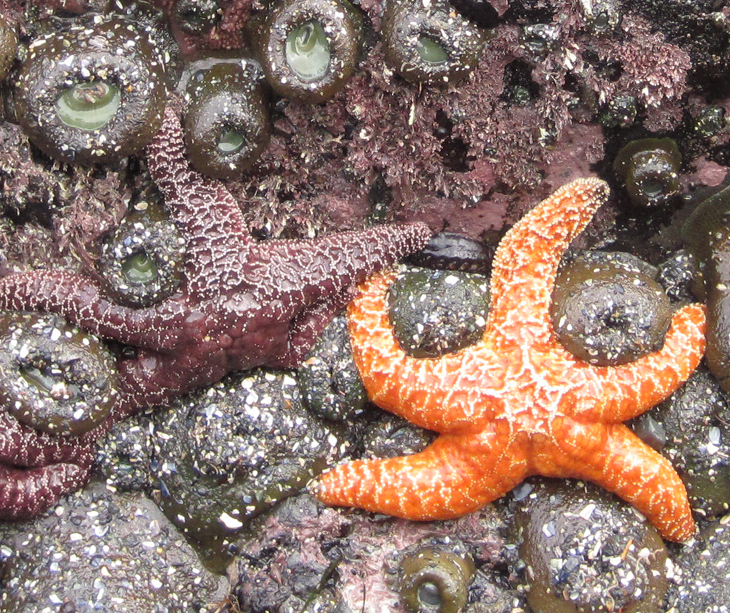 Then after another decline, seastar numbers started to increase in 2009 to a high of over 100 stars in the fall of 2012, shortly before the advent of the seastar wasting disease. In the spring of 2004, the push for methodological consistency among sites prompted the addition of a series of three large irregular plots to be sampled alongside the transects. Compared to the transect data, these plots contained a higher number of stars during their first few seasons of sampling (expected given the greater amount of area sampled), but with declines converging toward the transect data numbers in more recent seasons. Seastar sizes have been measured since fall 2000. Large recruitment pulses occurred in the spring of 2002 and again in the spring of 2011. The growth of these seastars through time can be seen in these trend graphs through spring 2006 and fall 2012 respectively. Another pulse of larger stars occurred in spring 2010. Given this observation, it seems that the population of seastars at Carpinteria is supported both by recruitment and by migration of existing stars in and out of the contiguous subtidal. The seastar wasting disease struck this site in the spring of 2014. During an initial site visit in late February, a large number of stars (46) were counted in the transects one of which was clearly diseased. Hazardous conditions prevented us from completing the sampling that day (including seastar surveys within the irregular plots), but general observations at the site determined that more diseased stars were present and that a large number of seemingly stressed stars were found detached or loosely attached on the inner reef flats where they do not regularly occur. Then when we returned to the site a month later in late March, no stars could be found in any of the fixed plots and just five stars, including one diseased star, could be found in a supplemental sitewide search. Essentially the entire seastar population at Carpinteria crashed in that one month span. 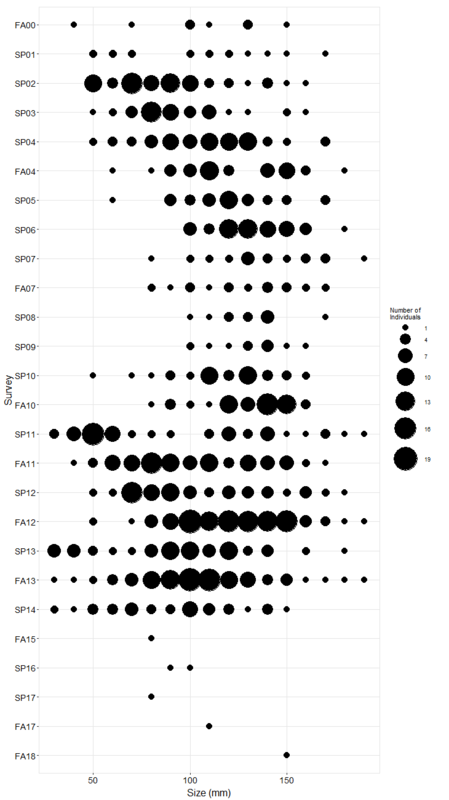 A similar finding was obtained during the following sampling event in fall 2014 with no stars found in any of the fixed plots and just six stars found sitewide. On a positive note, no diseased stars were found during the fall 2014 sampling indicating that the disease may have moved through the site and the remaining stars may have had some sort of resistence to the disease.